Dr. Anthony Balzano addresses the board. Photo by Jennifer Jean Miller. NEWTON, NJ – Sussex County Community College’s (SCCC) Vice President of Finance and Operations/CFO Frank Nocella reported at the Monday, July 28 college board of trustees meeting that as of June 2014, the college had clocked in 67,000 credit hours. Though last year, the credit hours were 72,066, Nocella was still hopeful. The goal is in the 75,000 to 80,000 credit hour range, with 90,000 credit hours the most ideal. “Our work now is on the enrollment side,” Nocella added. He said that the reduction of operating expenses could help to make this goal closer to reality. Nocella additionally said the operating budget now has 2.4 months of cash on hand. Sussex County Community College President Dr. Paul Mazur noted that the college has done well with accreditation audits, and the school’s most recent performance will help. “We’ve had a couple of good audits and hope we have something more to show them,” Mazur said. Parker focused on the school’s articulation agreements in effect with several institutions, including one that is recommended for approval with Berkeley College. Ramapo is one college that Sussex County Community College has an agreement with. Parker relayed a portion of an email correspondence to the crowd from a student at Ramapo that had graduated from SCCC that had been sent to a member of the faculty, which she said spoke volumes. “’Your faculty members have planted seeds that you don’t even know about,’” Parker read. During the public portion of the meeting, Dr. Anthony Balzano, Professor of Anthropology & Sociology and Vice-President of the Sussex County College Faculty Federation offered encouragement to the board and administration. Balzano expressed concerns about the college’s D-building potentially being “offline” during the spring and fall of 2015. Discussion about the Horton Mansion is off the table until the next trustee meeting on September 22. Hank Pomerantz, a member of the adjunct faculty, did mention that he met a member of the Horton family when he volunteered his time at the recent Thursday on the Green. The family member asked what was happening to the home. Pomerantz offered to sign a waiver, and said he would gladly take photos of the interior and its current condition. He mentioned about special programs that the Home Depot and Lowe’s also offer for renovations of soldiers’ homes. “So many people could get involved to save this building,” he said. Betty Allen, an historical society member presented the trustees with a preservation project article and suggested it could be a project to teach the students. The trustees declined to break into executive session at last night’s meeting and all voted against it. “I’m adamantly opposed into going into executive session to discuss what we have to discuss in the open,” Parker said. Mazur advised that the college has hired a third law firm, Saiber, to review questions that have come up regarding the Building D construction. Mazur said the college had met with their attorney and “we were advised to be proactive with this, and get this done in an efficient manner,” in terms of a review. A small scuffle of words ensued during this discussion, when board member Daniel Perez complained that his questions on the topic of Saiber were not answered. 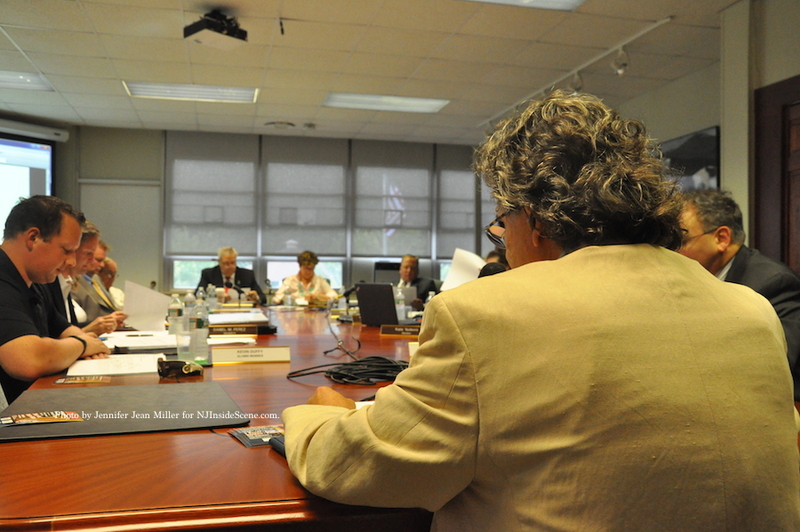 Gavan countered that Perez’s list of questions to fellow board members on the topic were only presented on Friday, July 25 after 5:30 p.m.
Mazur announced the upcoming “Rockin’ Fest” to support student vets. The event is free and scheduled for Saturday, September 13, from 11 a.m. to 6 p.m. with seven bands, food, vendors, and raffles. Parking is $10 per car and $5 per motorcycle.